We had to wait an extra day to see the game between the fourth ranked Villanova Wildcats and the sixteenth ranked Providence Friars because of Snow Storm Jonas, but we were rewarded heavily for our patience. The game took an overtime period to be decided but gave us some reasons to already start getting excited for the rematch between these two formidable teams on Saturday February 6th at the Dunkin’ Donuts Center in downtown Providence. Providence College prevailed with a 82-76 victory behind a monster effort from Sophomore standout Ben Bentil and sealed their biggest and toughest win so far this season. The Big East Tournament is certainly shaping up to be a slugfest amongst the top teams in the conference come March. Ben Bentil is a motherfucking MONSTER. Ben had a game-high 31 points on 11-19 shooting, one shy of his career-high 32. Ben had a game-high 13 rebounds. He played a Bryce Cotton-like full game (45 minutes) for the third straight game. Ben was 8-10 from the free throw line and is now 81.6% from the line this year, good for 8th in the Big East. Ben is now averaging 19.8 points (1st in the BE) and 8.2 rebounds (5th in the BE) per game. Ben is good at basketball. Bentil is a match-up nightmare for teams. He can punish guys down low, make you pay from outside if you don’t respect his shot, and blow by you with his athleticism if you try to take his shot away. He runs the floor like a gazelle and has a non-stop motor at all times. He’s played himself on the 1st Team Big East squad for the year and potentially an All-American team (1st, 2nd, or 3rd) if things keep going like they have been for Big Ben. Kris Dunn was a little sloppy with the turnovers (6) for parts of the game, but he made up for that by tying a career-high best 14 assists. The Wildcats were throwing a lot of zone at the Friars, tying to make them beat them with long-distance shots, while also trying to mitigate Dunn’s drive-and-dish mentality with at least a couple of guys on him at all times. Bentil made them pay for it. Since I lauded Bentil’s statistics amongst the Big East elite, it only seems fair to throw out some Dunn season stats at this point. 17.0 points per game rank second…behind teammate Bentil. 7.1 assists per game rank first. 2.94 steals per game rank first…by over a full steal per game. Roosevelt Jones is second with 1.68 spg. I’ve said it before, but no matter how Kris Dunn plays in the first 30 minutes of the game, there’s no one I want with the ball in his hands more at the end of the game. He seems to raise his game to another level. Want a couple of examples? OK, here you go. The Mean Mug is perfect. I need more Mean Mug in my life from Dunn. I need to see some stats on his 3-point shooting in the last five minutes of the game compared to the first 35 minutes of the game. I swear he’s shooting like 70% from three at the end of the game. The last foul called on Kris Dunn that fouled him out of the game was ridiculous. It wasn’t even a touch foul, it was no foul at all. Thank God that didn’t come back to haunt the Friars because I’m not sure they could’ve held on if the game went to another overtime period. Kyron Cartwright has been pure fire since he was inserted into the starting lineup for the Friars. He seems more confident and he’s been playing with a confidence that is exciting to see. I want to coin him the nickname “True Grit,” but I feel like it would sound corny from me but cool from somebody else. So if someone else can just start that up, that’d be great. Cartwright has scored in double figures in each of the last 3 games. He had 10 against Seton Hall, tied his career-high with13 against Butler, and matched that career-high 13 against Nova as well. His 3-point shot looks miles ahead of where it was last year and you can tell that he believes it’s going in when it leaves his hands. Cartwright and Bentil, who are roommates, seem to just know where each other are going to be on the floor. They are the alley-oop combo on this Friars squad. I can never give Junior Lomomba enough credit. I always (along with pretty much everyone else including Coach Cooley) call him the ultimate glue guy, but he’s so much more than that. He reminds me of Niles Giffey from the 2014 National Championship UConn team. He chipped in 12 points, 4 rebounds, 3 assists, and a steal, cause he’s awesome like that. So damn likable. Every championship team needs a guy like Junior Lomomba on it. I’m greatly anticipating Quadree Smith’s return to the court but he has been PHENOMENAL on the bench during the time he’s been injured. 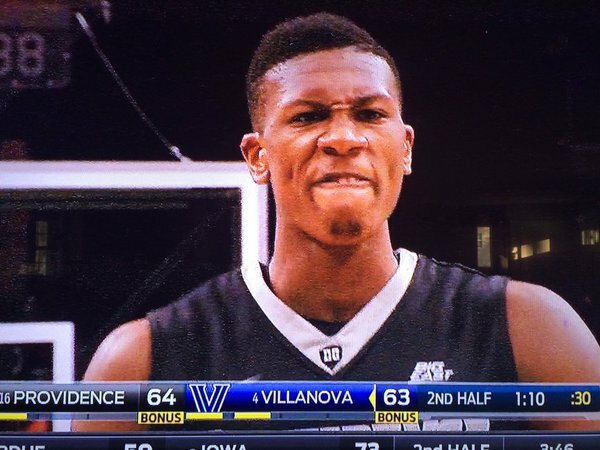 I’m looking at him every time the Friars make a big play. The bench came up pretty much empty once again. The trio of shooters (Lindsey, Edwards, & Fazekas) went a combined 1-6 from three and finished with respective 2, 0, & 3 points. It didn’t bite them in this one because the Friars avoided foul trouble for the majority of the game but one of those guys is going to need to step up in some extended minutes soon. Rodney Bullock remains super underrated. You might not expect it (I would) but he’s currently 7th in the conference in rebounds (7.2 rpg), 17th in scoring (12.9 ppg), and 6th in blocks. This a heck of a third scoring option. I can’t stand Ryan Arcidiacono. He’s annoying. He flops. And he’s good, which makes you hate him more as an opposing fan. That being said, that was a hell of shot with the three to tie it at the end of regulation. I think Josh Hart is the best player on that team and I don’t think it’s that close. I thought Daniel Ochefu was a lot better than this. The Villanova senior had only 7 points and was completely dominated by Ben Bentil for the entire game. In his last 5 games, he’s scored 6, 6, 4, 6, & 7. Ouch. Nova Freshman Jalen Brunson is going to be a stud. That kid can play. Now, let’s beat the crap out of Xavier and make it 3 wins over ranked opponents in a row. Tonight is the first ever game at the Dunk that will feature two top ten ranked teams.